The Porch. Is there anything more Americana than a couple in love, sitting on a porch swing and whiling away a summer evening? Now imagine that scene on one of our Teak Swing Seats by Barlow Tyrie. Your porch won't be complete without a rocking chair (or two!) and one of our good ol' fashioned porch swings. Under the Arbor. Porches aren't the only spot to hang a swing. We also recommend an elegant arbor, complete with a flowering climber that will permeate the air with a delectable floral scent. While your garden swing may tempt you to whisper sweet nothings in one another's ears, we promise it will always keep your secrets. Underneath the Old Oak Tree. As much as we wish we could recommend hanging your teak swing from the limbs of an old oak tree, the reality is it isn't all that safe. 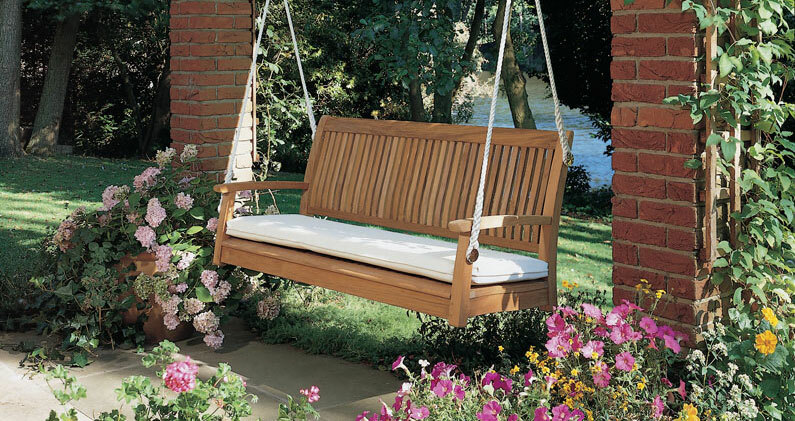 Instead, use a swing frame and set your swing underneath its shady limbs. You will catch the best of the summer shade, a soft breeze, and the song birds' melodies. For more outdoor seating ideas, continue perusing the Didriks online store.